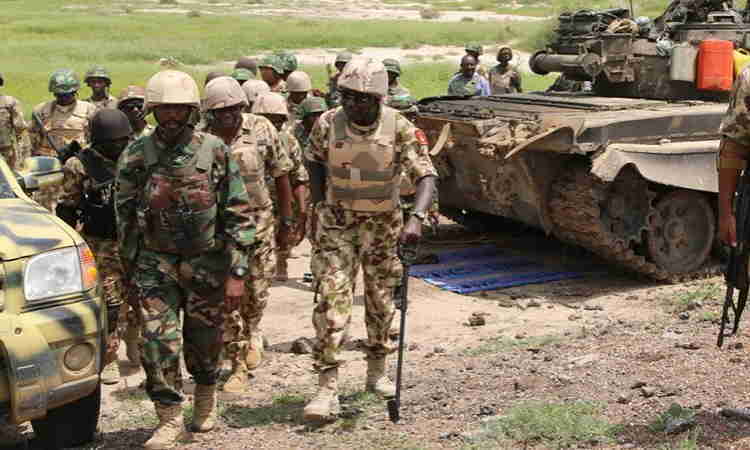 Soldiers on internal security operations in the North East are said to have killed 27 terrorists at Wulgo, Tumbuma, Chikun Gudu and Bukar Maryam villages in Borno State. The soldiers who were on clearance operations in the area and in the fringes of Lake Chad, were also said to have recovered assorted arms, ammunition and other equipment from the terrorists. Acting Director Army Public Relations Colonel Saghir Musa, who made this known in a statement listed the recovered weapons to include five Gun Trucks, Several Motor Cycles, five AK 47 Rifles, one Automatic Revolver Galil Rifle, one G3 Rifle, 2 General Purpose Machine Gun, 2 Anti Aircraft Guns 4 Rocket Propelled Gun Tubes, one PK Machine Gun, one M21 Rifle, one Locally Made Dane Gun, 5 Rocket Propelled Gun Tubes Bombs, one thousand Assorted rounds of different calibre ammunition, five AK 47 Magazines, Several Links of 12.7 MM, one Land Cruiser Buffalo, one Nissan GT, one Land Cruiser, one flag and a Grinding Machine. Saghir’s statement made available to Daily Sun reads; “Troops of Sector 1 Operation LAFIA DOLE, in a joint clearance operations with Cameroon Defence Force, on the 13th of April 2019 had a fierce encounter with Boko Haram terrorists at the Northern part of Wulgo, Tumbuma, Chikun Gudu and Bukar Maryam villages. “Coordinated military operation is ongoing especially in the fringes of Gombaru-Ngala and surrounding areas to deal with the fleeing bandits running out from Multi National Joint Task Force (Op YANCIN TAFKI) onslaught on their hideouts”.